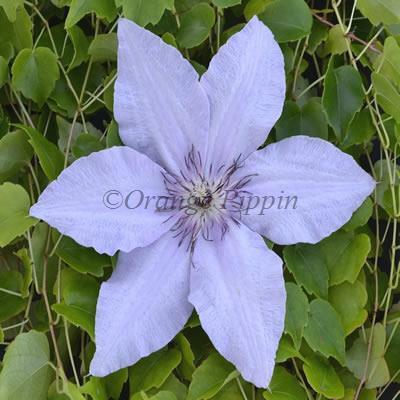 This elegant variety of Clematis has very large, star-shaped, silvery mid-blue flowers with pretty pink and red centres during May, June, then again in September. Clematis 'The First Lady' can produce flowers as large as 20cm across. Clematis 'The First Lady' was raised by Arther H. Steffen of Fairport, New York, USA. This non-evergreen climber can grow up a trellis, along a garden fence or wall, or trained up through a large shrub or tree, it is also suitable for planting in a container on the patio.